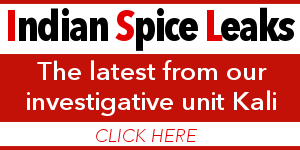 Thousands of people gathered to watch the Republic Day parade on Saturday, 26 January, in New Delhi’s Rajpath. 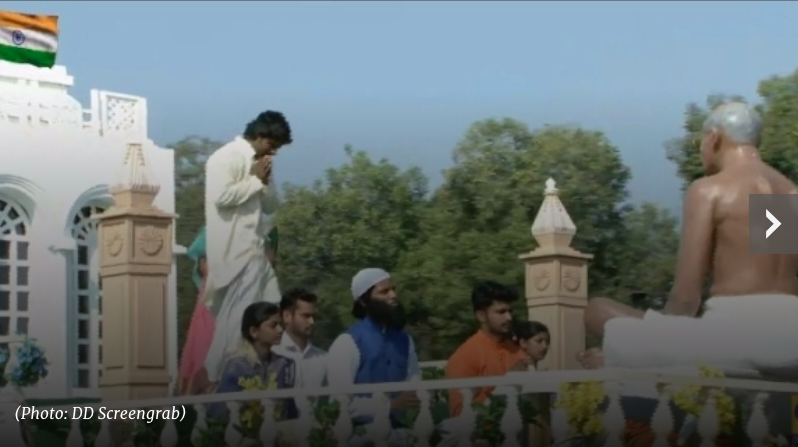 Prime Minister Narendra Modi paid his tribute at Amar Jawan Jyoti, ahead of the parade. 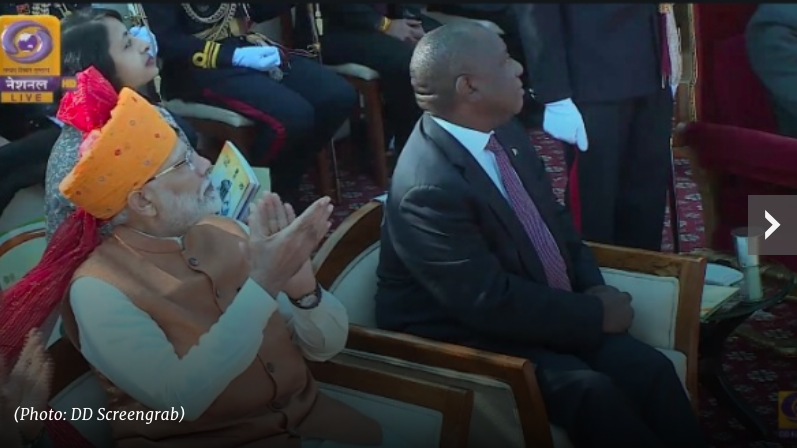 PM Narendra Modi and South African President Cyril Ramaphosa witness flypast at Republic Day parade in Delhi. 33 people on 9 motorcycles make a human pyramid during the Republic Day parade. 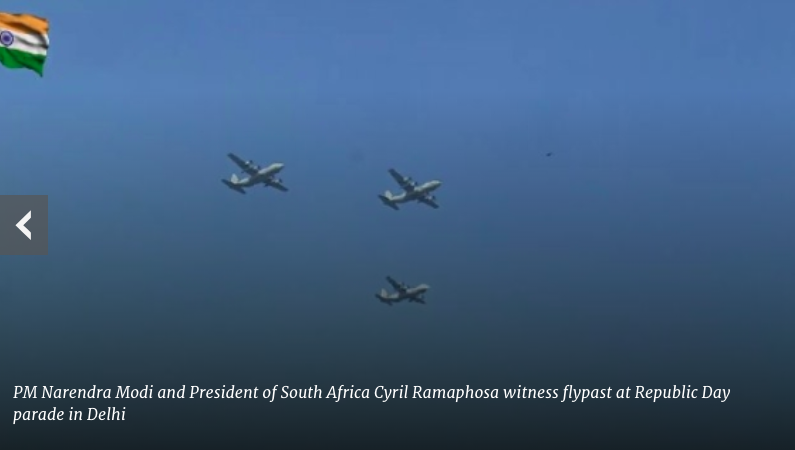 Subedar Major Ramesh A lead this formation. 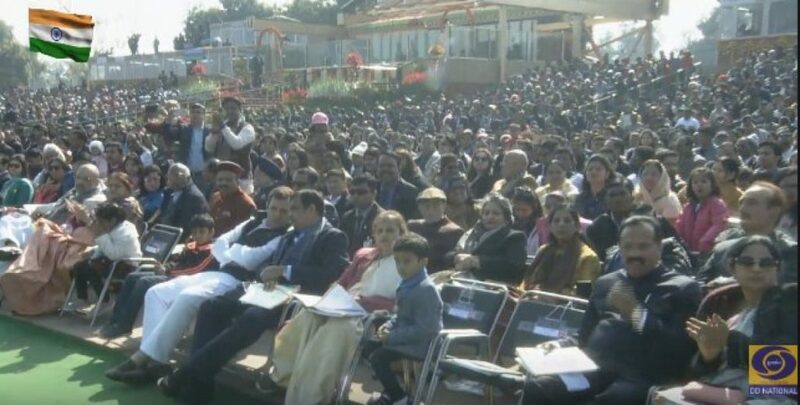 Congress President Rahul Gandhi and Union Minister & BJP leader Nitin Gadkari at Republic Day parade at Rajpath in Delhi. 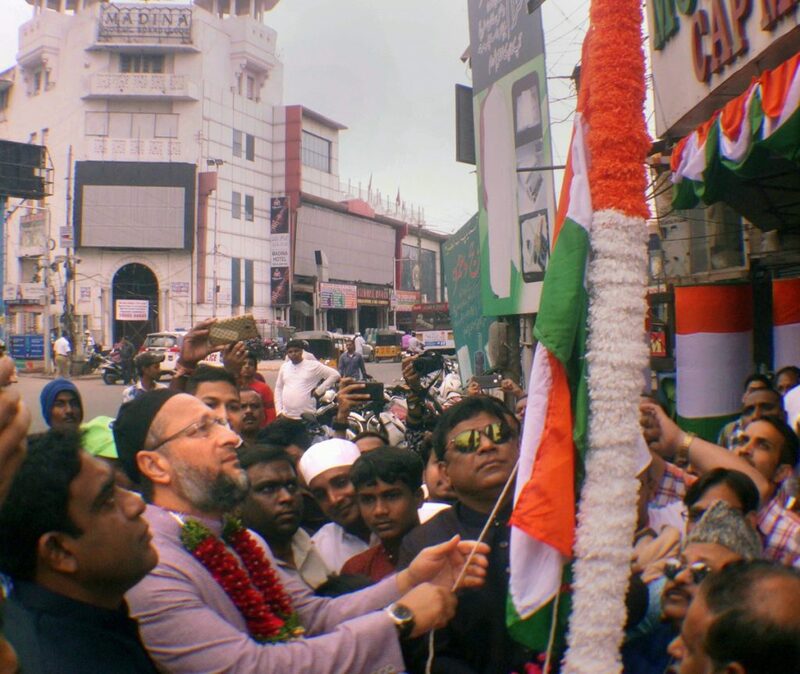 AIMIM President Asaduddin Owaisi unfurls the national flag during the 70th Republic Day celebrations at Madina Circle in Hyderabad. 26 children, including 6 girls and 20 boys, have been honoured with Pradhan Mantri Rashtriya Bal Puruskar 2019. 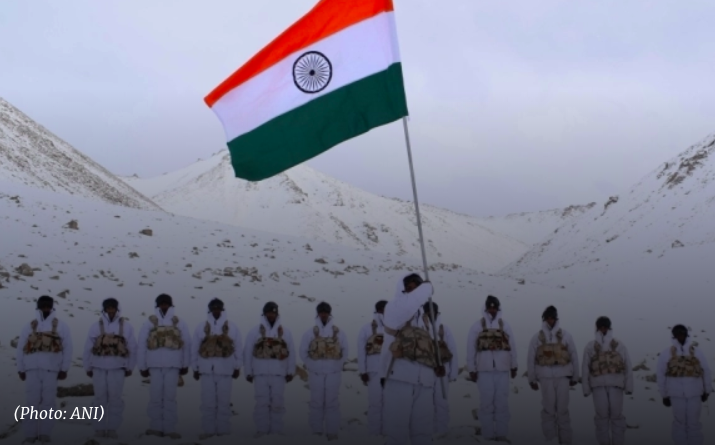 The Indo-Tibetan Border Police personnel celebrate Republic Day at 18,000 feet and -30 degree celsius in Ladakh. The tableau of Delhi showcases Mahatma Gandhi’s association with Delhi and Birla House, which is now known as Gandhi Smriti. 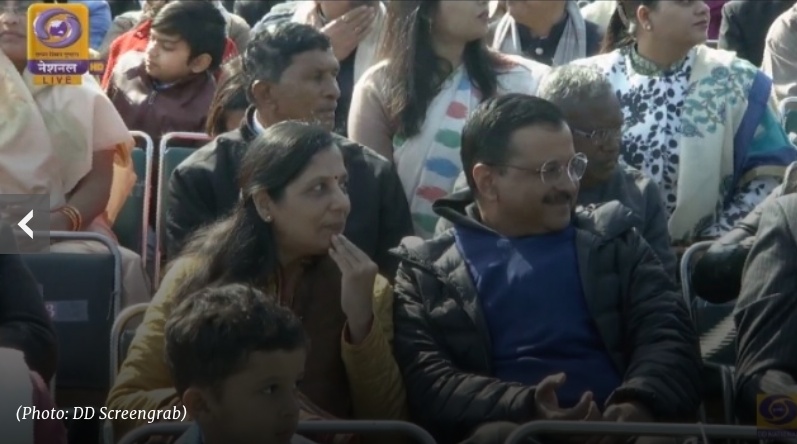 Delhi CM Arvind Kejriwal and his wife were present in Rajpath, to witness the parade. The Veterans tableau-2019, showcases the theme – ‘Veterans: Accelerators in Nation’s Growth’. Jammu & Kashmir Governor Satya Pal Malik unfurled the national flag in Jammu. The BSF exchanged sweets with their Bangladeshi counterparts, at Fulbari, at Indo-Bangladesh border near Siliguri in West Bengal. Visuals of the K-9 Vajra-T, a self-propelled howitzer, commanded by Captain Devansh Bhutani. President Ram Nath Kovind was awarded the Ashok Chakra to Lance Naik Nazir Ahmed Wani, who lost his life while killing six terrorists in an operation in Kashmir. The award was received by his wife and mother today. Prime Minister Narendra Modi pays tribute at the Amar Jawan Jyoti. Prime Minister Narendra Modi extended his wishes to Indians on Republic Day. Odisha Governor Ganeshi Lal present at Republic Day celebrations in Bhubaneswar.